WASHINGTON (Reuters) - The U.S. Federal Reserve should commit to letting economic booms run on enough to fully offset collapses like the 2007 to 2009 Great Recession, former Fed chair Janet Yellen said on Friday, urging the central bank to make "lower-for-longer" its official motto for interest rates following serious downturns. Yellen's approach, which comes in the wake of complaints by the Trump administration about Fed interest rate hikes, could imply a looser monetary policy stance amid Fed officials' concerns about tight labor markets and greater financial stability risks after a decade of low rates. 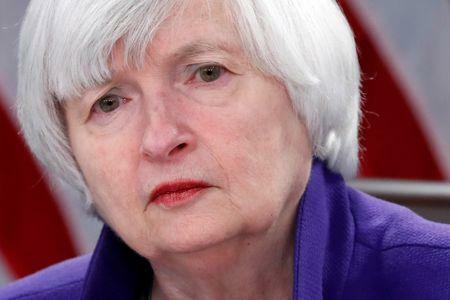 Elaborating on how the central bank should think about what to do if rates have to be cut to zero again in the future and can't go any lower, she said the Fed should promise now that it will keep rates low enough to let a hot economy make up for lost time. "By keeping interest rates unusually low after the zero lower bound no longer binds, the lower-for-longer approach promises, in effect, to allow the economy to boom," Yellen said in remarks delivered at a Brookings Institution conference. "The (Federal Open Market Committee) needs to make a credible statement endorsing such an approach, ideally before the next downturn." The approach reflects much of current Fed policy, which was largely set before Yellen left office. Officials, for example, view their 2 percent inflation target "symmetrically," and say they are willing to tolerate inflation a bit higher than that without overreacting, just as they were willing to tolerate inflation a bit weaker. But Yellen is urging them to go a step beyond, adopting some metric -- whether a measure of lost output, the sum of below target inflation, or some other measure -- that it would hit before raising rates too high, if at all. Her advice would not necessarily change where the Fed stands today. But it could become relevant as officials mull how to respond to a strengthened labor market, and signs of a pick up in wages and other costs -- the type of developments a "lower for longer" strategy would perhaps allow to continue without a reaction. The Fed could "emphasize that it anticipates that the additional stimulus provided by this approach will result in a period of exceptionally low unemployment and that inflation would likely overshoot ... perhaps emphasizing the desirability of compensating for a previous shortfall ... It could articulate that the FOMC's objective is to achieve inflation near 2 percent, on average, over the business cycle."